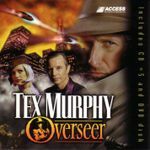 Tex Murphy: Overseer (1998) is the 5th (and as of now, the final) installment in the Tex Murphy series of adventure games for the PC. In it, the player controls Private Investigator Tex Murphy as he recounts the story of his first case to his girlfriend, Chelsee Bando. Overseer combined the use of full motion video (FMV) with 3D environments. Source: Wikipedia, "Tex Murphy: Overseer," available under the CC-BY-SA License.